Researchers from MIPT and teams in Russia and a few other European nations are the first to realize and record the phenomenon of water molecular dipoles alignment. The researchers achieved this by confining water molecules in nanocages inside a beryl crystal. The details of the study have been reported in the journal, Nature Communications. Ferroelectricity is a concept in solid-state physics. The term is used to refer to the property of a material, whose dipole moments, when cooled, arrange themselves in an orderly fashion. As the dipole moment of the water molecule (H2O) is very large (approximately 1.9 D, where ‘D’ denotes the unit measurement of electric dipole moment, debye) the molecular dipoles in liquid water are expected to interact strongly with each other, align themselves in a particular pattern, and exhibit ferrorelectric behavior. However, ferrorelectricity does not occur in liquid water, as the molecules are located too closely that any interaction that may occur is dominated by short-range hydrogen bonds, which dampen the long-range dipole–dipole forces. When water molecules are made to interact with other surfaces or structures, or are confined in sealed cavities of appropriate nanoscale dimensions, there is a significant change in the situation. Under these conditions, the hydrogen bonds can be “redirected” to interactions with these foreign surfaces, and thus, can be diminished. As a result, the interactions of the water dipoles can be brought to the fore. The scientists developed an unexpected and subtle method of designing conditions where the dipole-dipole interactions of water molecules can be more powerful than the hydrogen bonding. They confined individual water molecules in a nanosized cavity network in a beryl crystal. 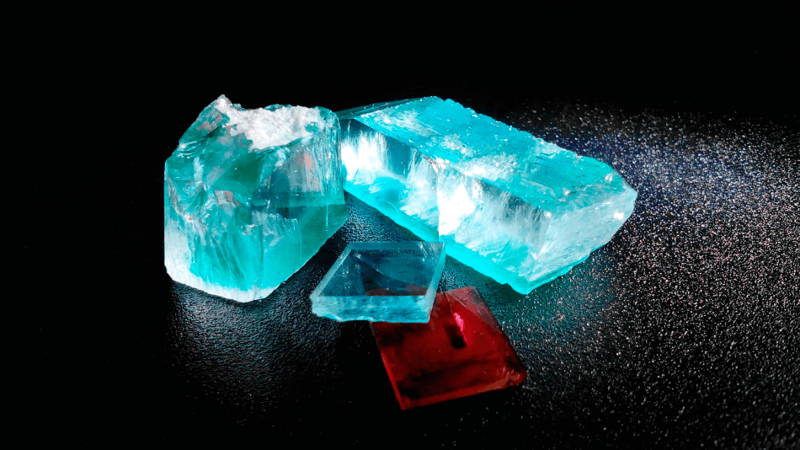 Beryl is a mineral employed as gemstone; aquamarine and emerald are the two most popular varieties. The cavities in the crystal are placed at regular intervals, and thus, enable mathematical analysis. There is a 5 – 10 Å (angstroms) space between the cavities, making the hydrogen bonds (with effective interaction range of 1 – 2 Å) negligible and the dipole–dipole interactions (with effective interaction range of 10 – 100 Å) significantly effective. Ferroelectric materials have certain characteristic features or ‘fingerprints’ that allow experimenters to accurately deduce the dipolar ordering of a system. For instance, the Curie-Weiss law states that the dielectric permittivity of a ferroelectric material can vary with temperature. Another instance is the concept of a special absorption resonance at terahertz or infrared frequencies, the parameters of which rely on temperature. This resonance is known as the ‘soft mode.’ The team found all these characteristics in water “dissolved” in the beryl crystal. Our team has succeeded in placing water molecules under conditions allowing us to obtain the first-ever reliable observations of the alignment of molecular dipoles of water. As for possible practical applications, their scope could be fairly wide. It should be noted that the researchers now have the opportunity to study this phenomenon under the influence of various external factors—temperature, pressure, the ionic environment, etc., and thus advance our understanding of this phenomenon and its role in various systems, including living organisms. The electric fields that are created by nanoconfined water can have a significant role to play in several phenomena studied in chemistry, biology, meteorology, geology or even in the formation of planets in the solar system. As a matter of fact, numerous computer simulations and calculations anticipate the ordering of water molecular dipoles, if the hydrogen bonds are “diverted” to “target” cavities or surfaces, such as 2D metal substrates or carbon nanotubes, which are artificially introduced. However, despite innumerable attempts made by scientists worldwide, reliable experimental proof for the dipole–dipole alignment of water molecules is yet to be obtained.